I was in the parking lot at the mall in Florence Kentucky, on the Macy's side entrance on November 18, 2007 and saw your wife with another man. I so happened to have a news article on the front seat of my car and it had a picture of your wife on the front of one of the sections. When I saw your wife as I parked I grabbed the article and looked at her and then the picture several times and was stunned. She was standing between cars in the parking lot about half way out from the mall entrance. I saw a man with her and it looked like they were scoping out cars in the parking lot. I watchd for sometime and it appeared they locked their keys in the car or so it seemed. I took the opportunity to rip the picture from the paper and bring it with me to them. The man walked into the mall and when I approached her she was nervous acting and I asked if she locked her keys in the car to ease her anxiety, she said yes. When I asked which car, she said he will be right back and he will take care of it. I asked if I could call the cops for her and she said "just mind your own business". I pulled the picture out and said "have you seen this woman" and she said, "Please don't ruin my life please, I just want to be left alone, please'. I pulled out my cell phone and she ran flat out and cut through cars and ran and I could not track her. I drove around the mall and encourter a Boone County Sheriff deputy and told him he might want to t look for a woman that looks like Stacy Peterson in the parking lot and he said "yeah ok, if it is I'm not going to help him that crooked cop" I assume meaning you. I am afraid to come forward due to the press and I took a picture of her on my phone but I am afraid that the press will victimize me. If this goes to trial I will appear on my own, I will wait to see how this pans out, I am sorry, I am afraid what will happen to me if I come forward, everybody thinks your guilty because of the press. Fox news has a evil woman named Kimberly Guilfoyle and she is an ex-prosecutor and she is attacking you and I am sure fox will attack me if I come forward, like the rest of the press. January 6, 2008 Florence Kentucky Anonymous Letter postmarked 12/29 ILL "An attorney says a former suburban police officer suspected in his wife's October disappearance received a letter from a person claiming to have spoken to the missing woman. Joel Brodsky says former Bolingbrook police officer Drew Peterson opened the letter Sunday after returning home from vacation. It was postmarked December 29th. The letter's anonymous author claims to have seen Stacy Peterson and another man in a parking lot in Florence, Kentucky, in November. The writer says when he approached the woman and showed her a picture of Stacy Peterson, she asked to be left alone and then fled on foot." 12/29 letter ILL MARY FRANCES BRAGIEL, REPORTER, NEWSRADIO 780: "You know, I spoke to family members about this letter. They don`t believe it`s the least bit credible. I spoke to a spokesperson for the Boon County Sheriff`s Department, who says that the Florence -- you know, this took place in Florence, Kentucky, and the Florence, Kentucky Police Department handles that mall where Stacy Peterson was supposedly seen. And he asked his investigators. 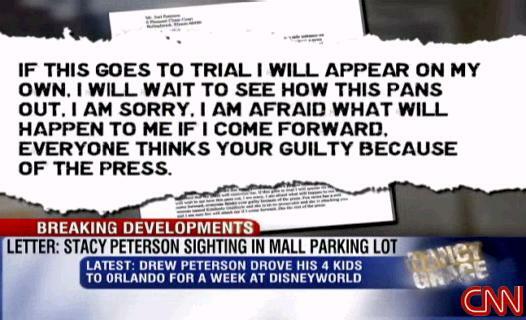 Nobody knows anything about the supposed conversation that the author of the letter had, you know, talking to an investigator, saying that he saw Stacy Peterson. I think the biggest question here, Nancy, is that the author of this letter claims they took a photo of Stacy Peterson. How come that photo wasn`t included in the letter?" NANCY GRACE: Sir, what route did your client take on the way down to Orlando? - BRODSKY: That I`m not 100 percent sure. I know he told me. I know he didn`t go near Cincinnati. And I know that he was, because I spoke to him, in Florida on the 29th. "Yes. It was her cell phone to his cell phone, and I know the Illinois State Police have those cell phones. They have those SIM cards" ILL JOEL BRODSKY: We don`t just have somebody who disappeared. We have somebody who called him and told him she had found somebody else and she`s leaving. - NANCY GRACE: Has that call been tracked? Has that call been verified? I mean did she call on his cell phone? Her home phone? - BRODSKY: Yes. It was her cell phone to his cell phone, and I know the Illinois State Police have those cell phones. They have those SIM cards. - GRACE: Well, have you gotten evidence of that? I mean the cell phone bill would come there to the home, would it not? - BRODSKY: The Illinois State Police has impounded all those records. - GRACE: No. - BRODSKY: I can`t get to them. We`ve tried. - GRACE: No. No, no, no. That bill would come to his home, would it not? - BRODSKY: No, that -- that record, those phone records have been impounded by the Illinois State Police. We could not get to them. - GRACE: I`m not asking whether you can issue a subpoena duces tecum for documents. - BRODSKY: No. - GRACE: I`m saying that would be on a valid monthly bill that would come to Drew Peterson`s home. Did he get it? Did he show you the bill and go look, here`s the phone call? - BRODSKY: No. That bill didn`t come. The Illinois State Police have impounded all those records. We do not get that bill. We do not have those records. They have them.